We spend a vast proportion of our time inside buildings. There is a growing trend to green our buildings (Biophilic Design) to encourage physiological and psychological wellness as well as decrease air pollution and energy consumption and develop community and creativity and the benefits go on and on. This month’s sustainability blog is written by Paul Teraci, one of The Blue Room Theatre’s most dedicated members. He talks to us about the exciting community garden initiative at one of Perth’s most iconic skyscrapers, QV1. I have been the General Manager of QV1 (award winning ‘skyscraper’ on St Georges Terrace with a large public space plaza at its base) for the last 11 years. My first show at The Blue Room Theatre was Specks in the Black with Tim Watts and Arielle Grey in April 2007. I think I have seen just about every show at the Blue Room since then. 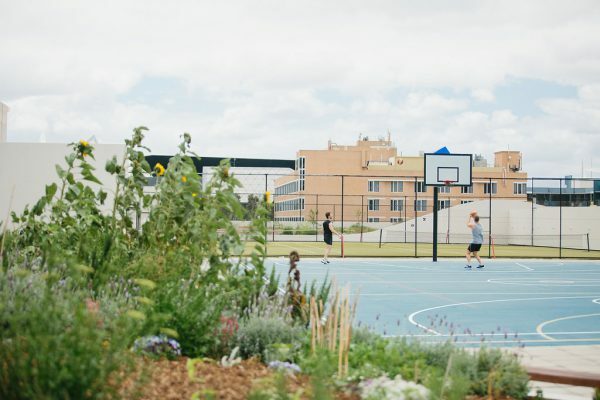 Our Community Garden is located on the roof of QV1’s public car park, across the road from the main tower, next to the building’s gym facilities. The garden provides the perfect setting for tenants to grow their own produce, with 10 companies currently managing their own plots. Tenants can also hold casual get-togethers and events, or even hold meetings and work with a shaded seating area and Wi-Fi. I came up with the idea about two years ago after the garden beds were emptied to undergo some maintenance – I asked the owners if they would support the idea and then explored the level of interest from the tenants and basically it developed from that point. A recent visit to the US (San Francisco and New York City) prompted the idea for the garden – I saw the space and put two and two together. The garden is made up of tenant managed garden plots, communal herb patches, citrus trees and areas of native plants. The garden is managed by the QV1 community, for the QV1 community. There is a range of companies from the building who participate, including Tiny’s Bar (QV1’s bar/restaurant) who grow produce for their menu. I love this – the public get to taste what the garden produces. There are also two beehives which produced some great batches of honey – the bees are very busy so we are hoping to get some more soon! We currently have 11 chickens which provide us with eggs daily. These are collected and the tenants involved in the garden can take them home. The chickens get a lot of visits – especially from the children from Nido Childcare Centre, which has recently opened at QV1, who feed them the green waste from their garden plot. We also encourage users to invite friends and family to visit and have had small groups from children to retirees and people with disabilities visiting the garden. There is also a barbeque area for tenants to use and a garden shed which is full of seeds, equipment, garden tools and even a fridge to make sure there is everything you might need for a successful gardening session! These types of spaces definitely help with putting the ‘life’ in the work-life balance, which is so important. It is a great place for workers to relax, enjoy gardening and the sunshine and connect with others. The garden also helps us to be more sustainable which we have a strong focus. Organic waste is collected from some of the building’s tenants which is put into a mechanical composter that produces compost to use in the garden within 24 hours. The garden has created a great sense of community. We have monthly BBQ’s and harvest and planting events throughout the warmer months and the QV1 businesses have got really involved – often sharing produce and chatting about their plots. This increased interaction between the building’s tenants provides a warm, friendly atmosphere which spreads throughout the building. I just hope this helps people think about where else they can do something similar. Although we have a very unique space for our garden here at QV1, other buildings could create some green space even if it’s on a smaller scale. It’s a good opportunity for workers to improve their health and wellbeing which is such an important part of a modern office environment.